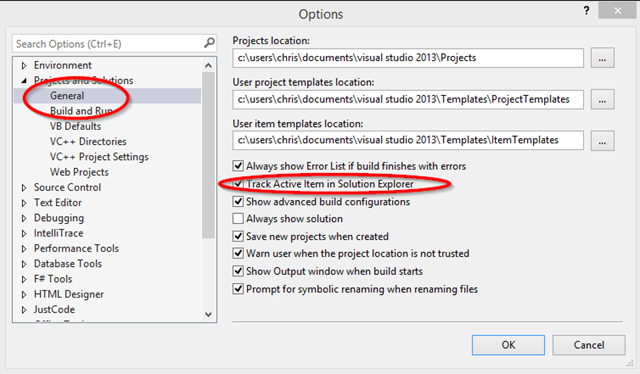 Every time I switch version of Visual Studio I need to go looking for how to enable this feature. When I’m working on a file, I want to see that file highlighted in solution explorer, not some other file. I don’t want to have to go searching for the current file. To achieve this, just go to Options>Projects and solutions>General and pick Track Active Item in Solution Explorer. ← Windows Server 2012: Where are all my processors? Great! Just what I needed. Installed VS2012 on new laptop and was not tracking what report I was on in Solution Explorer… Thanks!